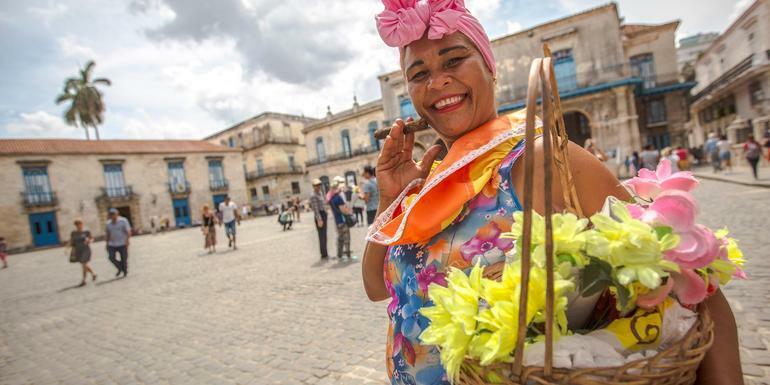 The melody of horns floating through the air, classic cars parked in colonial squares, revolutionary statues — get over the resort wall and discover the real Cuba! 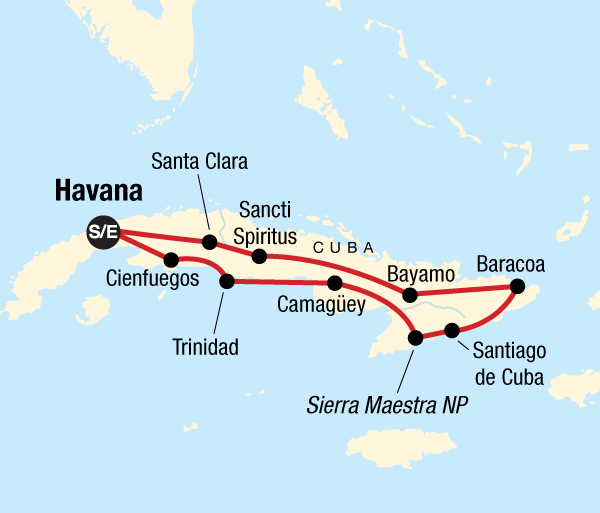 Travel east to Santiago de Cuba and Baracoa and encounter the birthplace of Cuban rhythms and revolutionary fervour. Soak in Spanish heritage while exploring churches, forts, and cobblestoned streets. Stay overnight in homestays for an immersive Cuban experience few travellers get to enjoy. Don't just walk down the road less travelled — dance down it. Viva la Revolución! Only ground transport Private vehicle, walking. Local Flights If required all local flights are included in the cost of your tours unless otherwise noted. It is important that we have your passport information at the time of booking in order to process these tickets. Internal flight tickets are issued locally and will be given to you prior to the flight departure. Accommodation on this trip is mostly, if not entirely, in 'casas particulares', the Cuban equivalent of a bed & breakfast. These local accommodation options allow you to participate in a typical Cuban living experience by staying with a family in their home. The family rents a bedroom or two (twin or single) with private bathroom shared amongst guests. Groups are usually spread across multiple casas with a central meeting point for evening socializing in the towns. Hotel service standards can be fairly low in Cuba and in complete contrast to the price paid for these accommodations. Casas are usually very centrally located and a great base for exploring Cuban towns and cities. Utilizing the local accommodation puts you closer to the Cuban people and lifestyle and often provides a higher standard of service and comfort than in a hotel. MEDICAL TRAVEL INSURANCE From 01 May 2010 all tourists entering Cuba will require “Medical Travel Insurance” that is on a Government approved list. We urge you to check with your insurance provider to ensure your policy is on the list of approved providers. If it is not, tourists will be forced to purchase a Government approved policy on arrival in Cuba. The cost of buying this insurance in Cuba will be in addition to any insurance already purchased, and it is likely the rates for these polices will be inflated compared to what you may purchase in advance from home. G Adventures has insurance policies available for travellers from a number of countries at competitive rates, and our insurance provider has been confirmed as recognized by Cuban officials. We can assist with medical travel insurance for residents of the United States, Canada, and Australia. If you would like peace-of-mind and to purchase insurance from G Adventures, please contact our reservations team on 1800 465 5600 (from North America), or 08444 101030 (from the UK) or 39413 5820 (from Australia) or experience@gadventures.com DEBIT/CREDIT CARDS Please note that debit and credit cards that are issued by American banks are not accepted in Cuba and will not work at ATMs. In addition, it is recommended to contact your bank to advise you will be travelling in Cuba regardless of your nationality, as local ATMs are likely to block your card unless a travel notification has been set up. Eating is a big part of traveling. Travelling with G Adventures you experience the vast array of wonderful food that is available out in the world. Generally meals are not included in the trip price when there is a choice of eating options, to give you the maximum flexibility in deciding where, what and with whom to eat. It also gives you more budgeting flexibility, though generally food is cheap. Our groups tend to eat together to enable you to taste a larger variety of dishes and enjoy each other's company. There is no obligation to do this though. Your CEO will be able to suggest favourite restaurants during your trip. Please refer to the meals included and budget information for included meals and meal budgets. Resorts, hotels, and government-run restaurants are notorious for mediocre buffets and subpar food quality, but at casas and locally run restaurants you get the chance to taste real Cuban cuisine. Options may not be as diverse as back home, but you can expect to have simple, good, quality food. Based on Cuba's economic situation, there may be fluctuations in food supply and there are occasionally shortages of certain ingredients – which provides a great opportunity to try something new! Cubans rarely uses spices for cooking, so it's recommended to bring some of your favourite spices or hot sauce for a bit of added punch.